Toyota announced plans today to unveil a stunning new sedan at the New York Auto Show. The debut comes April 5 at 10:30, which is the second day of the media previews. The U.S.-designed sedan will have its global premiere in the Galleria room within the Jacob Javits Center at 10:30 a.m. EDT on April 5, 2012 as part of the 2012 New York International Auto Show media days. Hopefully it's second-day slot isn't as inauspicious as it seems. One Toyota insider, off the record, is projecting excitement about this sedan. It's already being suggested for design awards in spite of the fact it does not go on sale until later this year. 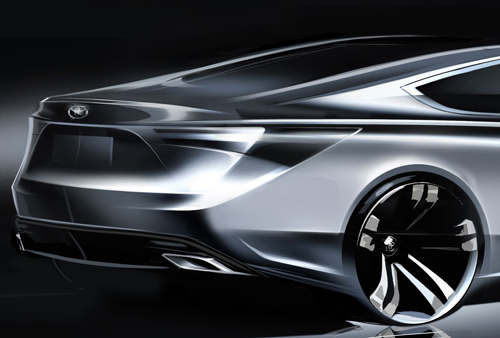 Toyota is being coy about what the new sedan will look like. All it would say in the media advisory is "The sedan’s exciting new design features an elegant yet athletic look." From the teaser photo released with advisory, it looks like this new Toyota borrows heavily from the Jaguar XF, which is a good inspirational starting point. The new Toyota sedan, currently unnamed (at least outside of Toyota) has elegant five-spoke wheels that are shod in performance tires. Toyota needs a winner in the design department. Its Lexus and Scion divisions have introduced some design winners recently including the Lexus GS and the Scion FR-S. Heck, even the Scion iQ is compelling in its own special way. Suspicion is that this will be the new Avalon, which is a model that is in need of a design upgrade. Would make sense on a lot of fronts, as that's their premier car before getting into the Lexus line.